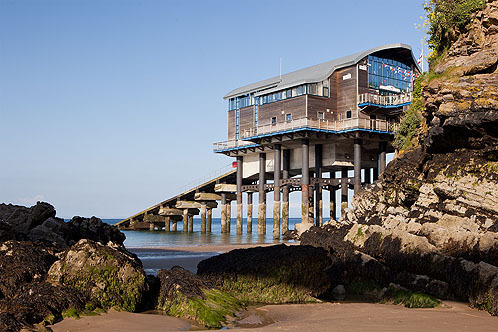 Tenby's new lifeboat station, completed in March 2005, was built where the Tenby Royal Victoria Pier ( 1899 - 1953 ), originally stood. Tenby was the first Station to use "The Tamar Class" all weather lifeboat , the RNLI's latest design . A 16m long craft , fibre reinforced plastic , crew of 6 ,weight 30 tonnes ,speed 25knots , range of 250 n.miles. An inshore D class lifeboat , five metres long , the smallest in the fleet is also based at Tenby Harbour.